We plant our soybeans with the same planter that we use to plant corn. We now use a self-propelled sprayer instead of this mounted boom. 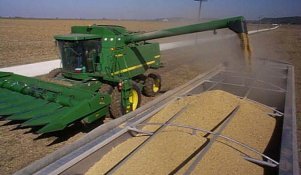 8 years ago we were using JD 9610 combines (above)and now we use JD 9870STS models (below). We used row-crop headers for many years...even though they look similar to a corn head, they are much different. The primary drawback was the maximun size was only 20feet wide. Now we are nearly twice that wide.